We’ve all watched humanoids in Star Trek or animals with human heads in Disney cartoons. Heck, people have humanized pets so much already, as if they’re people. If a pet owner can send their pets to school (for humans), they probably would. “Dog’s are man’s best friend,” so the saying goes. Perhaps one day men will go to a pub for a drink with their dog. For me, a human-cat companion who’d clean after their mess would be just fine … just no scratching or biting. I’m not saying this is their intention, because it’s not, but if this goes haywire, … remember, I wrote it. Organ transplant is such a weird business, but it saves lives. Unfortunately, not all organs can be transplanted. And there’s the risk of organ rejection, and the fact that the organ recipient will have to take anti-rejection pills for life is a huge commitment and expensive. If we can grow organs using our own genes, that would be perfect! 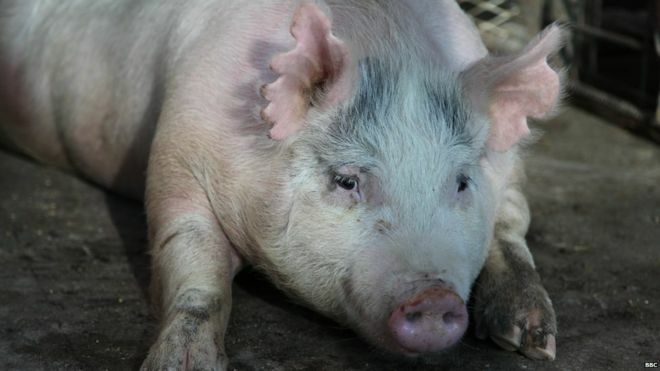 In the article, they talked about concerns with human genes migrating and developing in the pig’s brain. Perhaps, they fear that the pig may become more human, and its’ implications on ethics? We already know pigs are intelligent mammals, so what’s wrong with a little IQ boost? Perhaps they fear the intelligent pigs might rise and revolt against humans one day … “Rise of The Planet Of The Pigs!”? What actually concerns me are the implications of a human organ having pig genes. They mentioned that there’s no chance that’s going to happen. I’m not a geneticists, but isn’t it safe to assume that since the organ will be growing inside the pig, therefore, it will use pig blood and other nutrients inside the pig to grow, it will bond with the pig’s internal organs – e.g. womb. And as such, it will be exposed to pig DNA. So the harvested human organ grown inside a pig will have pig DNA, it won’t be purely human. What would this mean, in terms of heredity and compatibility with the human recipient? We wouldn’t know until they actually do the test won’t we? And why did they choose “chimera” to call the human-pig embryo? Aren’t they aware that it’s a Greek monster, an animal composed of more than one animal. Check the illustration, it’s hideous! Google it. Perhaps the thought of having a human-pig organ isn’t really far fetched! Well pigs can stomach just about anything, so perhaps it’s a good trait to acquire. Now, imagine pig genes migrating and developing in the human brain. We do have people who act like pigs already, so this isn’t something new. I don’t know which is less weird, waiting for another person to die so someone can use their organs or growing “spare parts” in another mammal. We shall see. In all seriousness, read the article by Fergus Walsh/BBC.